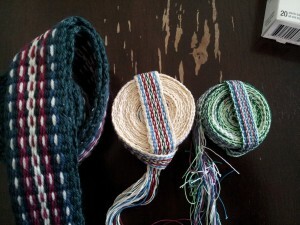 I’ve already posted some of my experiments with inkle weaving. Having done those, I decided to try my hand at embellishing my weaving. 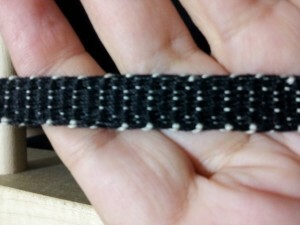 There are methods I wanted to try – brocading and pickup weaving. For some reason, I decided to try the brocading first. Brocading involves the use of a second weft thread or threads. Generally you want that thread to be double or triple the weight/size of your warp threads. This cuts down on the amount of warp that shows between your rows. 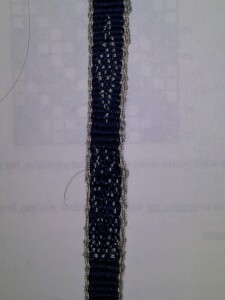 The brocade weft is woven through the warp in a pre-determined pattern, which usually looks like a cross-stitch pattern. Basically, the brocade weft sit above the warp where you want it to show and below the warp where you don’t want it to show. 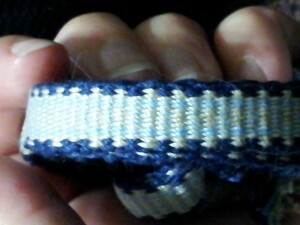 The regular weft thread is woven normally, with no adjustments. A celtic knotwork cross-stitch pattern that I used to try brocading my inkle weaving. 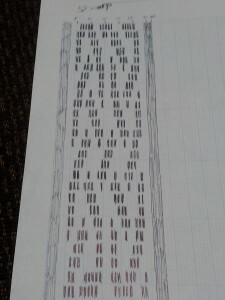 This is the pattern I decided to start with. I probably should have started out with something a bit simpler. Celtic knotwork really isn’t the easiest pattern to work with at first. I realized I was doing something wrong with my first try pretty quickly. It seemed like it took forever to get through one repetition of the pattern! This is the first try at brocading. Obviously something went wront. This is my first attempt. The bottom is the celtic knotwork – not even recognizable for what it is! Not understanding what was going wrong, I decided to try a simple diamond pattern . The result was a bit better – at least the diamond is recognizable! But it’s not anywhere close to solid like it should be. I went back to my instructions and re-read them, assuming that I had missed something when I read them the first time. As it turned out, it wasn’t so much that I missed something as that I mis-read part of the instructions. 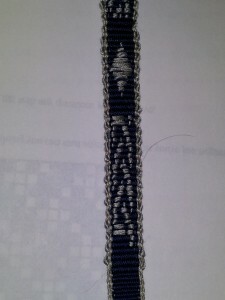 Having figured out what went wrong, I decided to try again on the same band of weaving. The second attempt at brocading. The technique is right, but only uses a single brocade thread. This time I got the technique right. the knotwork is more or less recognizable and the diamond is definitely recognizable. The only problem I had with this one is the amount of the warp showing through. Obviously a single brocade thread isn’t enough to make a fairly solid pattern. This is the third and final attempt at brocading my inkle-weaving. The only difference between this one and the second one is that I doubled the brocade thread. The patterns are both more recognizable for what they are and less of the warp is showing. I think that in the future I will either triple the brocade thread or use a thread that is the equivalent of a triple weft. Overall, I am very happy with the outcome. I feel like I have a solid understanding of how the process of brocading inkle weave works now and I think I can also apply it to card/tablet weaving in the future. I wouldn’t want to stop weaving in the middle of a pattern repetition – I’d be afraid I’d forget where I stopped. That being the case, I would want to keep my patterns small or make sure that I only wove when I had a good solid block of time. My current explorations are in the area of inkle weaving. I’ve been playing with patterns and thread sizes. I’m finding that the size 10 cotton crochet thread works up the quickest. It doesn’t snag on the heddles or pill and get fuzzy. The size 20 crochet thread might work up just as fast if my heddles were made of it rather than the size 10. The size 10 crochet thread also seems to have given the cleanest version of the pattern, though that might be as much from the color choices as the thread size. 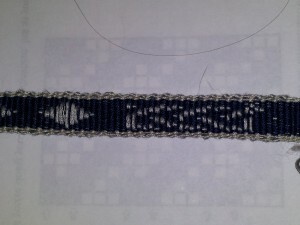 The most recently completed piece of inkle weaving was an experiment with which warp threads I heddled. In some spots I heddled two in a row and then left two alone. 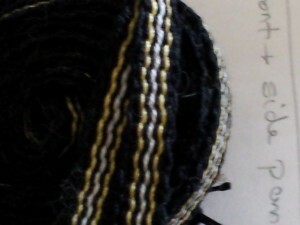 The result was a sort of speckled pattern where the weft showed through where the heddles didn’t alternate as usual. I’m wondering what kind of patterns I can come up with by coordinating various colors of warp and weft with heddle patterns.